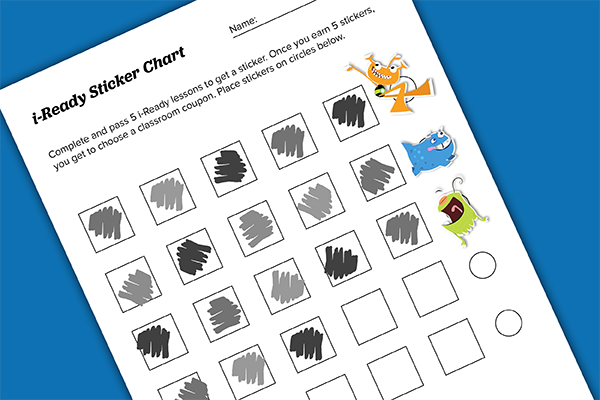 Laurel Henderson, a teacher, uses a sticker chart to track lessons passed in her classroom. She explains, "We use a sticker chart in my class. For every five lessons completed and passed, my students get to add a sticker to the chart. Once they earn five stickers, they get to choose a classroom coupon. I feel like this motivates them to take their time on the lesson because they have to pass the lesson in order for it to count. Once a week I check their progress on i-Ready and add everyone's stickers. My students get really excited to see how many they have earned for the week!"